This year, thanks to Voter’s Edge, 2.1 million people in California, Illinois, and New York were able to find the information they needed to cast more informed votes in the primary and general elections. During elections, the media is saturated with news and ads about presidential races and other high-profile contests. Meanwhile, voters (who often have limited time and access to information) struggle to find even basic facts about down-ballot races, leading them to vote on the basis of limited or misleading messages—or opt out altogether. That’s where Voter’s Edge comes in. 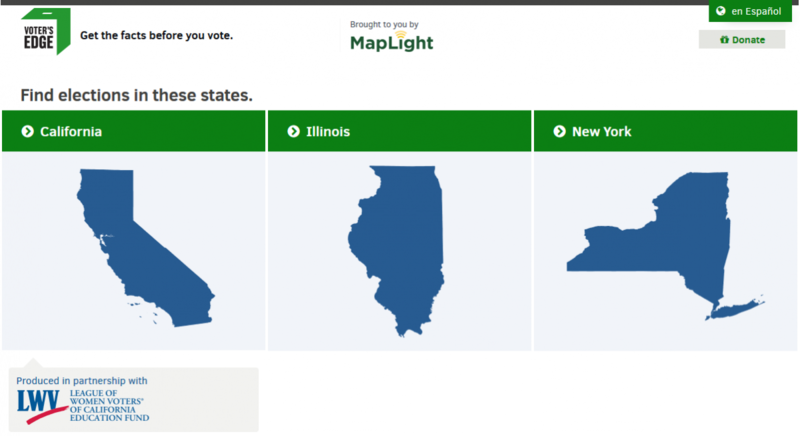 For the 2016 elections, MapLight expanded the groundbreaking Voter’s Edge California model—piloted in 2014 in partnership with the League of Women Voters of California Education Fund (LWVCEF)—to new territory. We covered federal, state, and local elections in Illinois and New York as well as California, giving more than one in five Americans access to information about every contest on their ballot. The fully redesigned guide featured a professionally translated Spanish-language site, a tool called “My List” that let users save their ballot choices for later, and a section explaining the basics of voting. In California, MapLight again partnered with the LWVCEF, whose well-established network collected data on state and local races. We also developed a new system for collecting candidate information in states like Illinois and New York that lack the LWVCEF’s infrastructure. Fifty media outlets and civic engagement groups shared Voter’s Edge with their audiences via co-branded sites, including NBC, ABC 7, Telemundo, the Chicago Sun-Times, the New York City Campaign Finance Board, New York Public Interest Research Group, KPBS, KPCC, KQED, Capitol Public Radio, and the Illinois Public Media collaborative. In addition, 80 organizations embedded widgets and logos linking to Voter’s Edge online. While most Voter’s Edge users were from California, we saw promising starts in Illinois and New York, with usage increasing between the primary and general elections. In California, general election site usage reflected a 51% increase from the November 2014 general election. Moreover, response to the site was overwhelmingly positive across all three states: in fact, in a survey, 97% percent of respondents stated that they found Voter’s Edge useful. MapLight thanks the William and Flora Hewlett Foundation, the Kaphan Foundation, The James Irvine Foundation, the Rita Allen Foundation, the Joyce Foundation, the Robert R. McCormick Foundation, the John S. and James L. Knight Foundation, and countless donors like you for making Voter’s Edge possible.